Hi,my 2001 Grand Espace 2.2 DCI has had an aftermarket cruise control fitted by the previous owner.It powers up and the diagnostic tests seem to confirm that everything is OK with the installation.However,the final part of the fitting is to connect the wire to a speed signal.This has never been done and I am at a loss to know where to find this connection.The original kit was purchased from Howard May who has been most helpful,but all of the info that he has seems to have different wiring to my car.I wondered if anybody here might have an idea where to connect this to.Any help would be extremely appreciated,as I would love to get it working properly.Thanks in advance for any clues. Hi I think you need to be looking at the TDC sensor as I believe it provides the ECU with speed data also. Hi,thanks for your reply.I think I should have made it clear that it`s a road speed signal that I need.I think that the TDC sensor will be engine speed unless I`m mistaken. No, the TDC sensor is only for ignition timing and engine rpm. This will not give any road speed data, CP. As for the cruise control - what make is it Phil? If it is the proper Renault accessory it will probably be different to an after market device. Also is the car you are fitting it to, a petrol or diesel, and manual or automatic? I once had a brilliant after market cruise control and the 'speed' sensing was very easy and novel. The cruise computer simply took a feed from the coil on a petrol engine so that it could sense the rate of ignition pulses at the instant you pressed the button to cruise at the speed you were doing at that moment. Then the cruise computer would maintain that pulse rate. 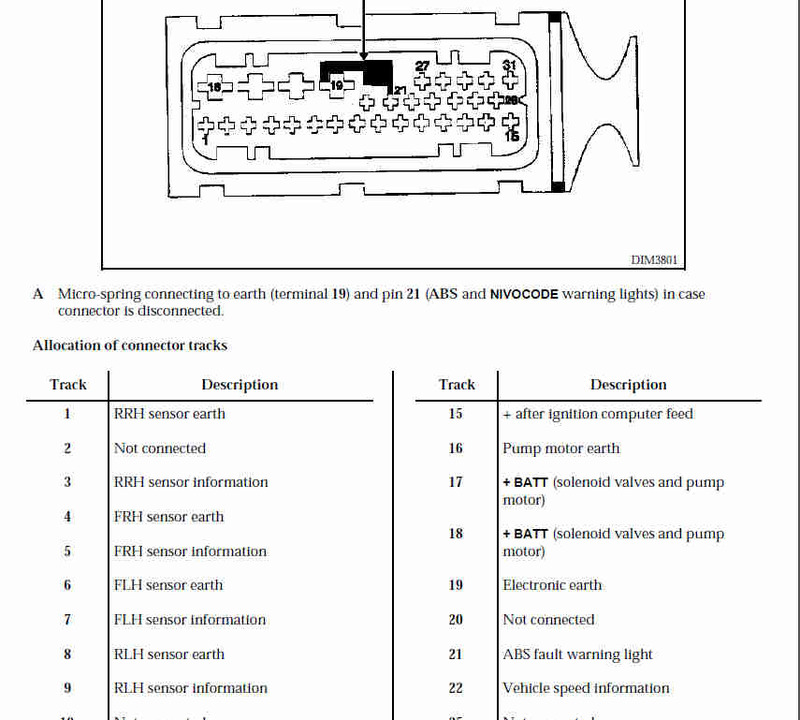 This means it would accelerate the car if the vehicle started to slow, or back off if it started to go quicker, and because of the speed of the computer it maintained the desired cruise speed extremely well, simply by keeping the ignition pulse rate stable at the rate when the cruise was set. Very simple but very effective. Other devices may require a connection to the speedo output from the gearbox. But none of them need to actually know the actual speed because you don't set a speed and expect the computer to take you there. You select the cruise at the time you are doing the speed you want it to maintain. The cruise computer will attempt to maintain the rate at the instant it was set. It won't know what that speed actually is, but it doesn't need to know it. It just needs a signal that is related to the speed the moment it was set, so it can maintain that. It could be a sensor by a drive shaft that measure the rate of rotation of the shaft, for instance. The computer will then try to maintain those revolutions and therefore it will maintain that particular speed. So another cruise control kit had a small magnet which you fastened to a drive shaft and you mounted a sensor near to it to detect it as it rotated. Hi Roy,It`s made by Howard May and the car is a 2.2 diesel manual.I`m definitely considering fitting a sensor to one of the driveshafts,as it seems next to impossible to fathom the wiring on the car. (I`m absolutely NOT an electronics expert).Thanks for your input. Hi Roy, It`s made by Howard May and the car is a 2.2 diesel manual. I`m definitely considering fitting a sensor to one of the driveshafts, as it seems next to impossible to fathom the wiring on the car. (I`m absolutely NOT an electronics expert). Thanks for your input. Is this the old mechanical diesel or modern common rail diesel? There used to be a pulse detection kit for old type diesels but I'm not sure it would work with a common rail diesel. The way it worked was that there was an attachment that went on to one of the long injection pipes from the injection pump to the injector, and this would sense the pulses of fuel and act just the same as the coil pulse system on a petrol engine. So that would be another way to detect a signal related to the speed which the cruise control could use on a diesel. However the drive shaft sensor would probably be a better bet since it would suit all types. One final thought, if your Espace has anti-lock braking, you have a speed signal coming from the wheel sensors. Would anyone or Howard May do something that could use a wheel speed sensor as the reference? Hi,sorry for the delay in replying,(been away for a few days).It`s the new one.Maybe the anti-lock brakes signal might be an idea.I`ll see if The guy at Howard May thinks it will work.Thanks for the idea. From a document in 'The Vault' espace abs. Pin 22 This signal will appear at the body control box but not looked it up yet. Thanks,that looks promising,but where is it on the car please? that is under the front left hand bumper. But should feed to the body controler in the footwell by the fuses. Thanks.If it ever stops raining long enough,I`ll see if I can trace it. I know this is an old thread, but I've been looking at doing this on my DCi espace. Although I've got some of the bits, I'm missing 2 pieces to complete the system, when I fit it and if it ever works, I'll describe my method as I am using the original Renault bits.